Excellence in end-of-life compassionate support, education and advocacy. 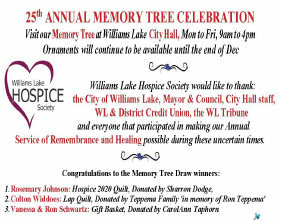 It is the mission of the Williams Lake Hospice Society to improve the quality of life of those individuals and their families facing life-limiting illness, death or bereavement, through skilled and compassionate support, education and advocacy. Hospice palliative care refers to physical, emotional, social and spiritual support and advocacy for those persons who are dying or bereaved. Care is based on a commitment to the whole person and refers to a model of care rather than a place. "Hospice...Making the road less lonely"